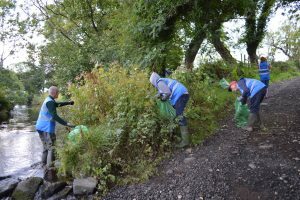 Invasive plants on our riverbanks is a cause for much concern among groups across Inishowen. 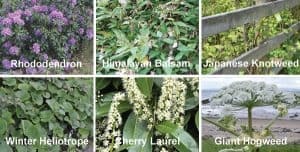 The Inishowen Rivers Trust welcomes records from the public of 6 key invasive plant species. These plants are considered invasive as they can create significant challenges for our native biodiversity. The IRT aims to map the distribution of these species across Inishowen and particularly on our rivers where they can cause bank erosion. 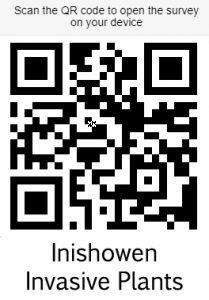 If you wish to get involved in recording Invasive Alien Plants (IAS) in Inishowen you can fill in our online surveys. Keep it handy on your smart phone and whenever you spot of these species you can submit it to us by filling out this simply form. You can also scan the QR Code to open the survey form directly. As the Trust gathers more information we will publish distribution maps of these species through this website. For more information on the impact of IAS you can download a presentation given by Mark Horton, the All Ireland Director of River Trusts at an event held in Colgan Hall, Carndonagh in September 2016. This will provide more information on how to identify each of the species. Himalayan Balsam has become increasingly common along Inishowen Rivers and spreads very rapidly if left unchecked. It is an annual plant which grows rapidly, out-competing native plants and in the winter, when it dies back, it leaves banks bare and at risk of erosion. 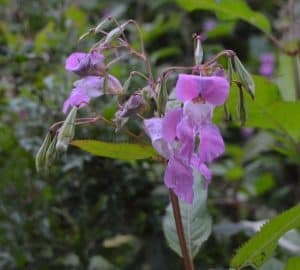 Himalayan Balsam can be easily uprooted by hand pulling and this can be an effective control method if carried out consistently by teams of volunteers. This is know as Balsam Bashing. 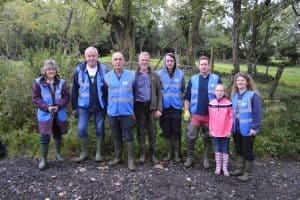 In August 2018 the Trust ran a balsam bashing event on the Culdaff River in an area with a heavy infestation of Himalayan Balsam. Further events will be run to raise awareness of the challenges IAS bring to our landscapes and how to effectively manage and control such species. If you would like to get involved in this type of monitoring or have a problem with balsam in your area please Contact Us. To support the work on IAS, the IRT has received funding from: LA21 Environmental Partnership Fund; Dept of the Environment, Community and Local Government and the EU Leader Programme.